Another edition of crap on the Internets that I find amusing! I’ve been delaying publishing this since I haven’t written a post of substance in a while, like about my Thanksgiving Turkey Trot, my Thanksgiving, or my cousin’s wedding, but I need to publish this before I add any more Tweets about Joe Biden in Costco. Pool report on Biden: "He flashed his Costco card as he walked through the doors to loud cheers." Bubble wrap stress reliving stations, what an amazing idea. One of my cousins got married yesterday. He’s the first one of any of my cousins, on either side of my family, to get married. 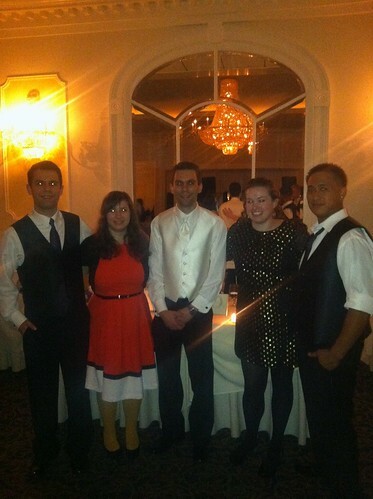 I’m not particularly close to any of my cousins, but obviously I was really happy for him and his new wife. 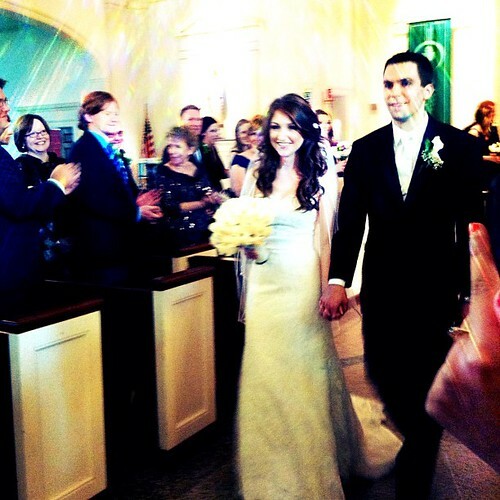 The happy couple. Her dress and hair were stunning. My OOTD. 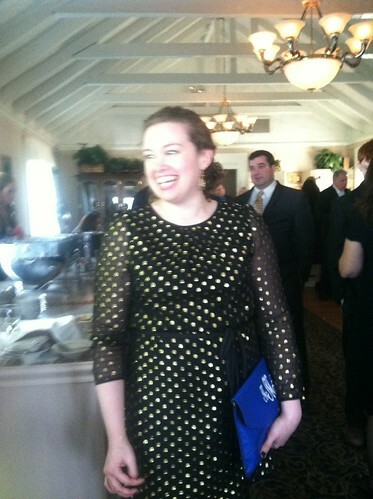 I love that dress, I got it from Anthropolgie and it’s amazing. I wish I could wear it every where. I also like this picture of me #vain. 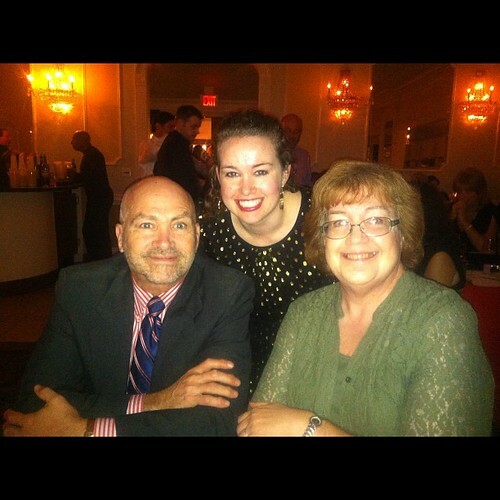 Me and my parents at the reception. And this was seriously the best thing ever. 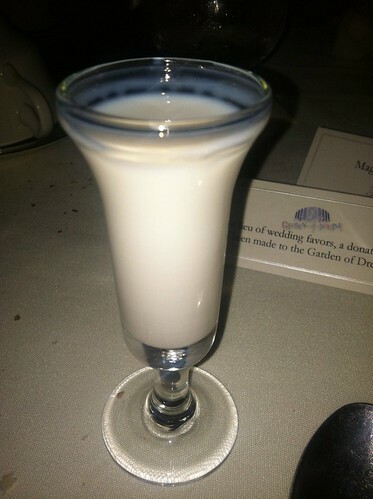 A white chocolate liquor that was on the dessert table. This is my new reason for wanting to get married. What a busy Thanksgiving! 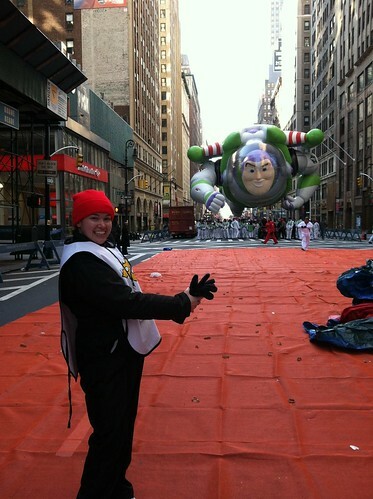 Rather than walking in the Macy’s Thanksgiving Day Parade like the last two years I ran a race! Yes, it’s true! 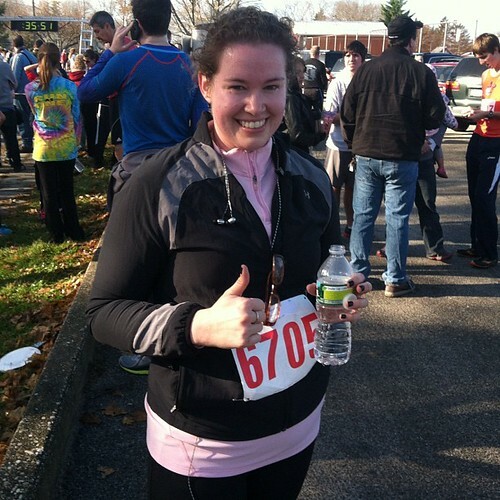 I haven’t run since May, but I thought why not do a hilly 5K? And I finished in 31:25! I was really proud of myself for that, thank you kickboxing. 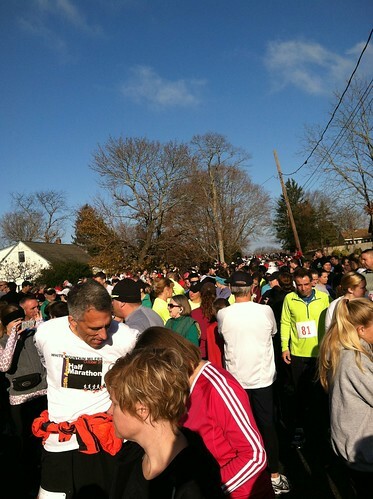 This is the same 5K I ran back in 2009 in 28:49, but I’m still calling this a win. 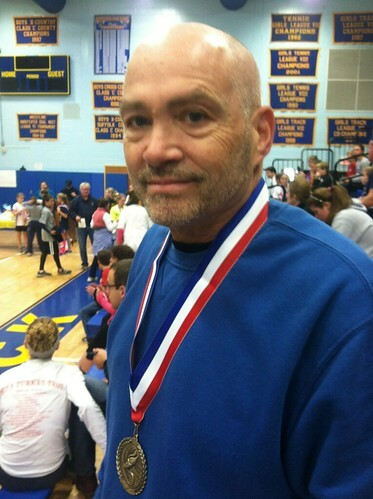 My dad won his age group this time and he was faster than in 2009 (although slower than he’s been the past two years, he’s continued to do it without me). The race has gotten much bigger for the last few years. I think the first year we did it there were a few hundred people and this year there were over one thousand. 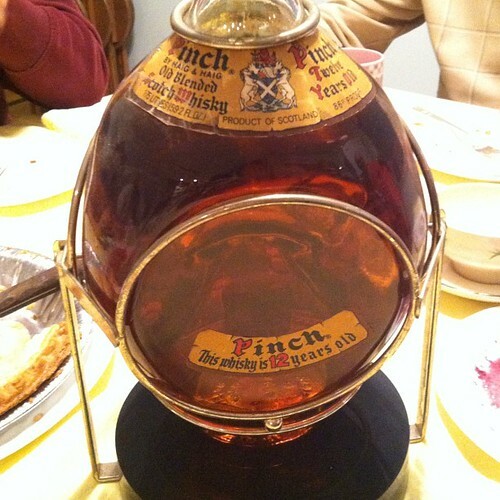 I have no pictures of our actual Thanksgiving dinner, which was catered, but I do have this crazy bottle of alcohol that we found in my grandparents’ liquor cabinet. My grandparents don’t drink, but before my grandfather retired (27 years ago) he always got liquor as gifts. So they have a fairly extensive liquor cabinet made up of really old liquors. Like this scotch. In an amazing dispenser. We all said we wanted it, but my grandfather wouldn’t give it up (he said one of his brothers, who died when I was very young, wanted it but my grandfather wouldn’t give it to him, to which my grandmother replied “WHAT ARE YOU GOING TO DO? BE BURIED WITH IT?!”). Oh and I did take a sip out of a 40 year old bottle of whiskey. It was very burny, but I survived. As I’ve been saying YOLO, you know? Before I get into what I’m thankful for can we take a minute to remember the amazingly cool thing I got to do the last two years? Walking in the Macy’s parade was a once in a lifetime thing I got to do twice and even though I didn’t want to do it again this year it was amazing and I loved it. It’s Thanksgiving so, predictably, I’m going to post about what I am thankful for. It’s obviously been a tough year for me, I’ve posted about that several times, but it’s also been a great year in many ways. And, even if it hadn’t been a great year I think the tough years often make you appreciate what you have even more. 1. My family. They might have tried to (unintentionally) drive me over the edge this year with stress and worry, but I am thankful for them regardless. I’m thankful for two parents who have always been there for my brother and me. 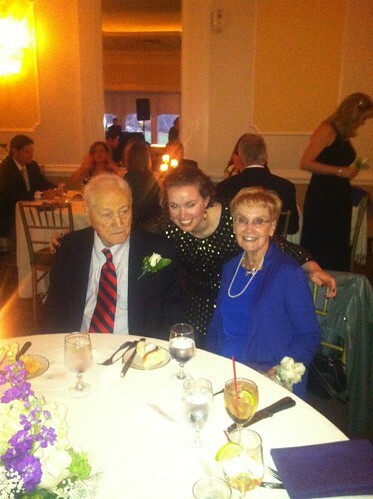 I am thankful for having four grandparents still around and nearly fully functioning. And I’m thankful for my extended family. We’ll be celebrating one of my cousin’s weddings on my dad’s side of the family the Saturday after Thanksgiving (he’s the first cousin to get married!) and through my visits to Oregon over the last few years I’ve gotten to know my mom’s side of the family even more. 2. My job. No, it’s not my great passion in life, but I am thankful to have a job nevertheless. I get a paycheck that allows me to do things I really want to do (or need to do), I get to travel to interesting places, I get to take home interesting books, and it provides me somewhere to go when the rest of my life is in complete disarray. 3. Kickboxing. I love kickboxing, have I mentioned that? I feel so thankful to have found a workout I feel passionately about, that’s easily accessible, and that I can afford. 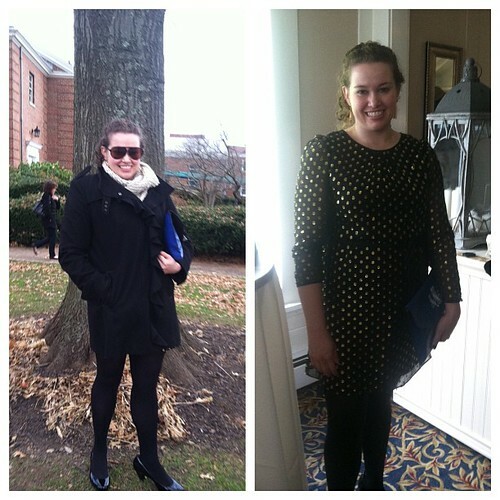 I can see such a difference in my body since I’ve committed to go 4-5 times/week and I feel so different. I used to hate squat thrusts and burpees and now I rock them. I used to barely be able to do leg lifts and bicycle crunches and now I’m like a machine (ok, not really, but I still do pretty well). 4. Books. Reading has given me so much this year. I really feel back in love with books and I am so happy. There are probably been times when I’ve used books as too much of an escape, but I still remain incredibly thankful for all the good (and bad) stories I’ve read this year. This is kind of going to be a weird association of two things. Family has been hell since the end of August, maybe if I’m honest since July. And I can’t change my family, I can change my roommates and friends, I can change my job, and I can change my extracurriculars, but I can’t change my family. And I don’t want to change my family, I just want to change my family’s circumstances. But I got some news this weekend that hopefully is a sign of things turning around and I am cautiously optimistic. Roommates/friends was good up until last week. And, honestly, it’s not that bad. I’ve pretty much ignored my social life this fall. I still see friends and go out, but it’s not really the priority it’s been in the past. I knew my roommate Abby was probably going to be moving out at the end of December, but getting actual confirmation of the news and starting to think about finding a new roommate just seems so overwhelming with everything else that’s happening in my life. Extracurriculars (which I’m not going to go into the specifics of just now) started out really, really great. And then at the end of October took a steep dive off a tall cliff. If you’re keeping track that means the four main aspects of my life have sucked for the last week or so. The only one that really matters to me is family and after the news I got yesterday I am feeling better about life in general, but the rest of it is certainly still stressful. 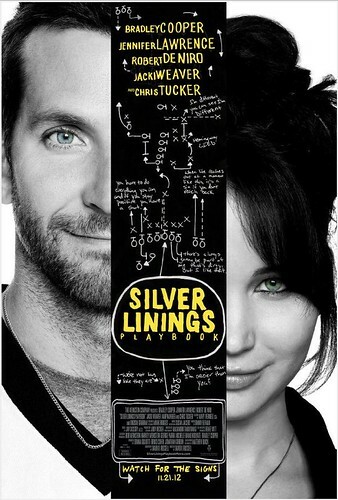 I went to see Silver Linings Playbook yesterday. I loved the book (I wrote about it here (please, someone cut me off from the smiley faces)) and I was so excited to see the movie. I was nervous about Bradley Cooper playing the main character and about Jennifer Lawrence, even though I love her, because in the book the female character is supposed to be in her 30’s. The book and movie were really different, the same basic story outline is there, but the order that things happen, the prominence of some of the characters, and the whole feeling is pretty different. I liked the movie, but it was very much a feel good, romantic comedy movie. The book is ultimately feel good, but it’s serious and dark, too. What I really liked about the movie is its portrayal of someone with mental illness. In the book Bradley Cooper’s character is portrayed as much much more mentally ill, but I still give the movie a lot of credit. I think it’s hard to walk the fine line between showing a manic episode and how serious and scary they can be, while not having it be about getting laughs. But then also showing the funnier, sweeter moments of mental illness. I did think the movie wrapped up a little too nicely and suddenly he just seemed cured, but it is a movie and not real life. And those two things are related, believe it or not. I’ll try to be back this week with some more posts. But if I fall of happy Thanksgiving!